While today is Opening Day for the major league team, its full-season affiliates begin their seasons on Thursday, April 7. Final rosters are expected to be announced today. Here are the roster breakdowns for each of the full-season affiliates: Pawtucket, Portland, Salem, and Greenville. This year I was a spring training rookie, making my first trip to Fenway South with the SoxProspects.com staff in mid-March. This past week I detailed what the day-to-day action is like there with some tips on how to make the most out of your time at the backfields should you decide to make the trip yourself in future years. Managing editor Matt Huegel was an extremely busy man during our time at spring training. As a result, he has been cranking out content since our return. Last Monday, Matt wrote about Michael Chavis (pictured, above). Chavis, a third baseman selected with the 26th overall pick in 2014, belted 16 home runs for Single-A Greenville in 2015. While he can put on a show at batting practice, but his defense is a work in progress. He told Matt that he lost 18 pounds in the offseason in order to be more athletic. During his time at Fenway South, Matt also spoke with catcher Austin Rei. Rei had a self-described "terrible half-season" last year, but says he has changed his hitting mechanics, which our scouts also noticed this spring. Finally, Matt posted a Q&A with righty Kevin McAvoy, who we expect to take his sinker up to the Portland rotation to begin the season. The first spring training video was published this week and it is a must-watch. Eighteen-year old phenom and third-ranked Anderson Espinoza is featured along with his upper-90s fastball and two potential plus secondary pitches. The editing staff did a great job with the video, posting the type and speed of the pitches for the first half. The second half of the video gives you the side angle with slow motion. SoxProspects.com also had a big announcement this week. The site previously used a customized scale to grade players that worked well in describing the different range of possibilities for players. However, the site has transitioned to the more widely used and uniform Prospect Scouting Scale in order to make it easier to compare to what other scouts, major league organizations, and talent evaluators use. Enjoy. Average pitching velocity continues to rise, but it is amazing guys that throw in the triple digits can still fly somewhat under the radar. 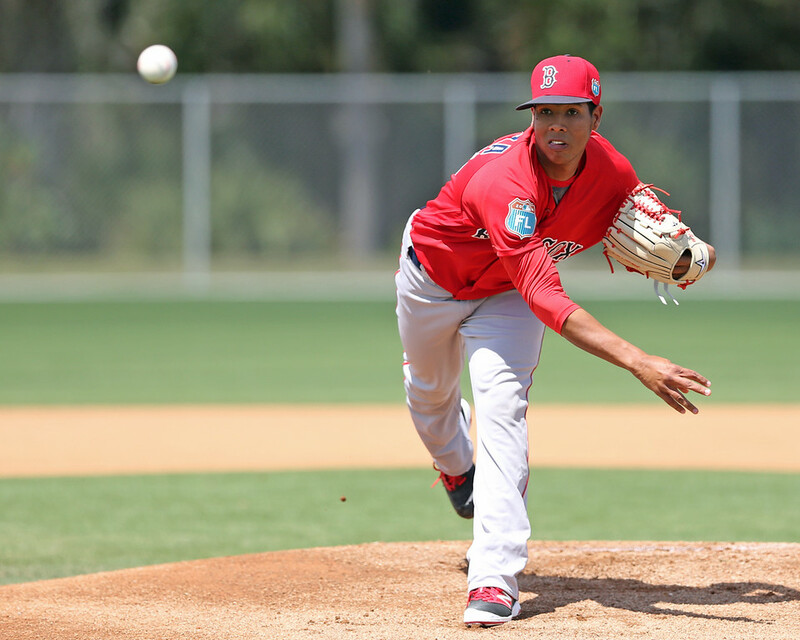 Baseball America's Ben Badler took a look at five such cases including the Red Sox' Victor Diaz, who sits in the upper 90s and has even hit 102 mph. Despite the huge velocity, the 21-year old only ranks 43d on the latest SoxProspects.com rankings, showing there is more to pitching than pure power. Badler also took a look at the signings for every organization over the 2014-2015 international signing period. The Red Sox ended up spending the second most during this period, largely due to the signing of Cuban and current top prospect Yoan Moncada for a bonus of $31.5 million. However, if you remove all Cuban signees, the Red Sox still spent the seventh most in baseball, including pitchers Espinoza and Christopher Acosta. Badler also broke each team down individually, including the Red Sox. MLB.com's Ian Browne writes that infield instructor Brian Butterfield has been getting worn out by first basemen Sam Travis as he works tirelessly to improve his defense and become a more well-rounded player. Last year the affiliate that seemed to get the most attention was the Greenville Drive, where many of the Red Sox' top prospects were playing, including Moncada, Rafael Devers, Andrew Benintendi, Chavis, and Michael Kopech (prior to his suspension). Ken Laird writes for WEEI.com that if you care about the Red Sox' future, the team to follow this year is High-A Salem, which is expected to have much of the same group. The two top pitching prospects, Espinoza (pictured, left) and Kopech, have gotten a large share of attention, and while Alex Speier touches on them, he also goes deeper when discussing the state of pitching on the farm for the Boston Glove. Former top prospect Blake Swihart starts the year as the Red Sox' number one catcher. 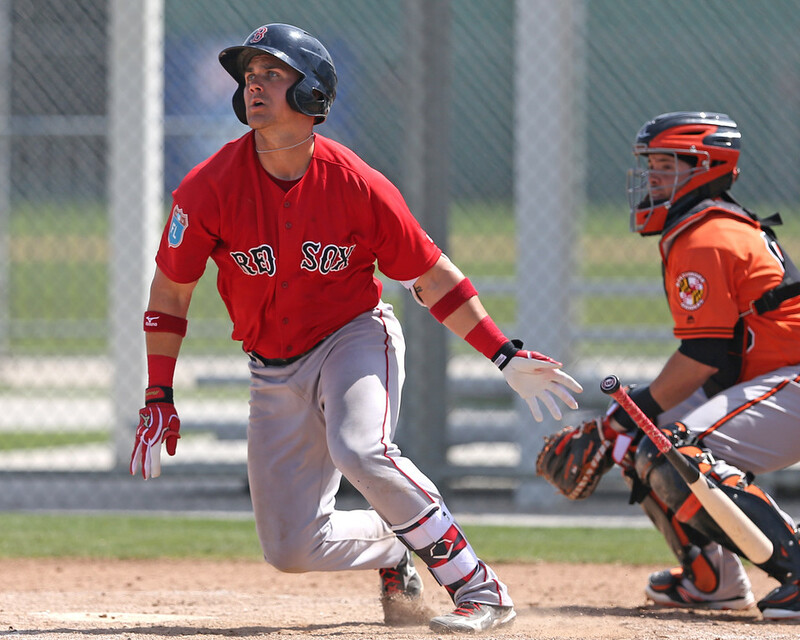 The second half of last year showed why he was such a highly-touted prospect, and BPBoston's Matt Collins writes that you need to believe in Blake's bat while supplying ample supporting evidence. In the last run of major-league roster cuts, right-handed reliever Noe Ramirez was awarded the final spot in the Red Sox bullpen, sending Roenis Elias to Pawtucket to continue to work as a starting pitcher. WEEI.com's Rob Bradford spoke with Ramirez, who described making the Red Sox as "something you dream about as a kid." The Red Sox announced this week that they have signed outfielder Justin Maxwell to a minor league deal. The move provides outfield depth. Maxwell, who will report to Triple-A Pawtucket, most recently played for the Giants where he hit a mere .209/.275/.341 with seven home runs, 76 strikeouts, and 20 walks over 249 at-bats while playing all three outfield positions. The Marlins had him in camp earlier this year, but released him last week. Photo Credit: Michael Chavis and Anderson Espinoza by Kelly O'Connor.